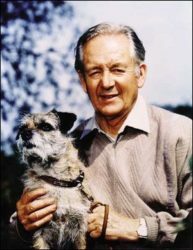 Jim Wight, AKA, James Herriot, died today, Feb 23, 1995. Feel free to look around at his works and life and times on this day of remembrance. In remembrance of Mr. Wight! I read and own all of his books; they bring back memories of my youth. Just watching the film on ITV4 and it reminded me of some of the stories my dad told me about Alf. You see my dad and granddad was one of Alf´s real clients..We strongly suspect that the Copfield boys, Frank and George refered to in one of books was in fact my dad (George Francis) and my uncle Tom. My dad bought his first car off Alf and included in the deal was a driving lesson, from Leyburn to Scarbourgh and back! I don´t think my dad ever told Alf that he too really wanted to be a vet, but as his dad couldn´t afford to send him to vet school it was a non starter. I have just read that Alf´s son Jim went off to be a vet in Staffordshire, if only he knew that is where my dad ended up and in fact where I was born. My uncle Tom however saw out his last years in Thirsk (he loved the horses).. I wonder if Jim ever reads this site, and if he ever remembered visting Park House Farm? My grandfather lived in Brandling Street, Roker, Sunderland and was close friends with the Bell family. I had read James Herriot books from being a teenager yet it was only when I was given the Biography by his son did the link come to light. My Father read the book and upon looking at the pictures he wondered what their family friend Stan Bell was doing in one of the pictures – the wedding one I recall. Its a small world, as they say. I have read this mans books so many times they are falling apart. And I am so ready to buy them all again. I have no problem saying James Herriot is the author who has given me the most joy in reading. He is without a doubt the most gifted story teller I have ever known. I wish with all my heart I could have met him. My favorite storyteller. I read his stories in the Reader’s Digest book club and then had to eventually get the collection. He could always take me away to a world that I would have loved to experience. I’m trying to think of the laugh out loud funniest story he told and it’s close between the Artificial Insemination story or Jimmy’s piano recital. I have to choose the former but it’s a close call. I’ve taken the James Herriot quiz and I’m proud to say I got a score of 10 out of 10. I’ve been “studying” him for 40 years so I guess I should have done well but I was surprised. How fortunate we all were to have the “friend” James Alfred Wight. My mom first turned me onto James Herriott when I was probably 10 years old. I love his writing and read all of his books multiple times. Well, I hadn’t read his books in many years, until recently. My mom has been very sick and entered hospice. As she became less responsive and slipped away from us, my wife suggested she was probably aware of our presence, and that I should read to her. It seemed only fitting that I pull out some James Herriott. She heard me read about Tricki Woo, dogs that were ‘womitin’ bad’, Tristan’s clashes with Siegfriend, and so on. The last thing I read to her was the last chapter of The Lord God Made Them All. It seemed fitting. Love the books today as much as I did the first time I read them.